Evaluated on the EOS 5DS R, the new EF 16-35mm f/2.8L III is one of the best performing Canon wide-angle zoom lenses we’ve tested, achieving an excellent overall DxOMark Score of 34 points. Crucially sharpness has been significantly improved in the outer field compared to its predecessors, which has helped boost its overall sharpness score to 24 P-Mpix, compared to 18 and 17 on the Mark II and Mark I respectively. Distortion and Chromatic Aberration results have improved a little compared to the Mark II as well, although you can still expect some barrelling over 0.5%, as well as a little fringing, using the widest focal lengths between 16-18mm. Vignetting is marginally worse than on its predecessor, with some fairly heavy corner shading using the wider focal lengths and maximum apertures, and the problem is only truly resolved between 24-35mm from f/5.6. Head to head against previous iterations the most significant improvement on the new EF 16-35mm f/2.8L III is sharpness. A notably higher overall sharpness score of 24 P-Mpix is predominantly down to significantly better edge sharpness at almost all settings, but specifically at 16mm using all apertures, as well as at the maximum f/2.8 aperture using all focal lengths. With the $999 EF 16-35mm f/4L IS costing less than half the price of the new EF 16-35mm f/2.8L III, the slower aperture version remains an excellent option if you don’t need the speed of an f/2.8 aperture. The EF 16-35mm f/4L achieves a lower overall score of 27 points, with reduced low light performance compared to the new lens, but the f/4 version also features image stabilization (IS) which could be an important feature if you’re shooting relatively static stuff, such as landscapes, and want to leave the tripod at home. The two lenses boast very similar levels of resolution, and although the EF 16-35mm f/2.8L III offers slightly sharper results at 16mm f/4, the f/4 version is moderately better between 24-35mm at the same aperture. The f/2.8L version is also slightly sharper in the corners at f/11 and notably better than the f/4L version at f/11 35mm, but the f/4 version still offers very good levels of sharpness if you don’t need the f/2.8L version for speed. If you’re after a high quality wide-angle zoom and high resolution DSLR the new EF 16-35mm f/2.8L III on the EOS 5DS R wins against the Nikon equivalents on the 36Mp D800E. 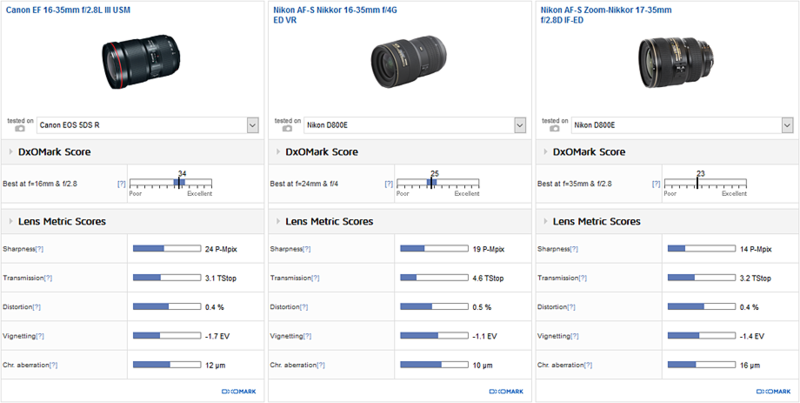 Better low light performance ensures a significantly higher overall score of 34 points compared to 25 and 24 for the Nikon 16-35mm f/4G and 17-35mm f/2.8D respectively. 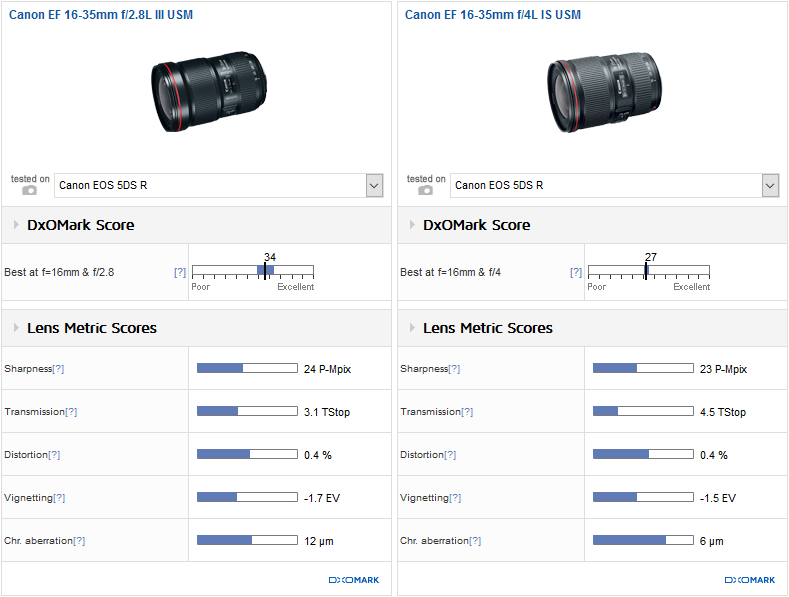 The Canon lens also offers notably improved sharpness on EOS 5DS R, with more consistent results at f/2.8 compared to the Nikon 17-35mm f/2.8D on the D800E. The new EF 16-35mm f/2.8L III also displays less chromatic aberration at the wider focal lengths compared to the Nikon 17-35mm f/2.8D. An important lens for many news, sports and event photographers who need speed and top performance at f/2.8, the improvements to edge sharpness on the new EF 16-35mm f/2.8L III will be appreciated. If it’s a lens you’re using on a daily basis, the improved resolution together with enhanced durability, including dust and water resistance, are probably enough to justify an upgrade from the ageing Mark I and II iterations. At $2199 it’s an expensive proposition though, not to mention big and heavy and, if you can live without its ‘fast’ f/2.8 maximum aperture, the cheaper, smaller and lighter 16-35mm f/4L version offers very similar image quality and sharpness as well as image stabilization. 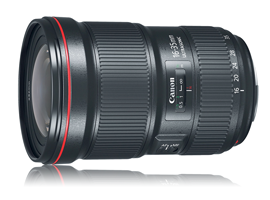 Cost aside however, the EF 16-35mm f/2.8L III is the best performing version of this lens Canon has produced and delivers excellent results. 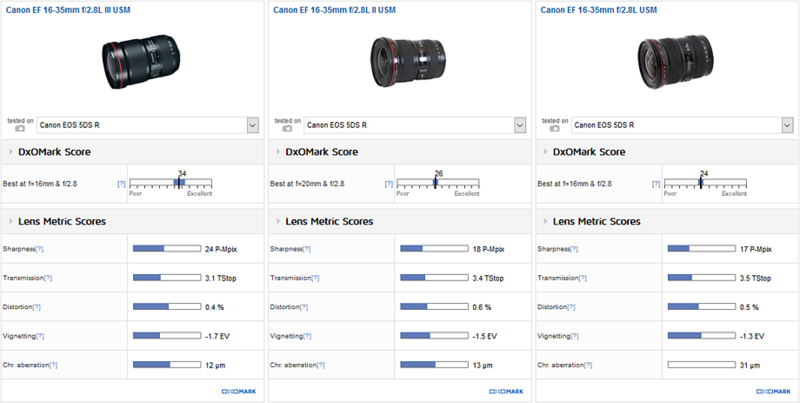 For further in-depth analysis of some of the main alternatives to the new EF 16-35mm f/2.8L III please see our Canon EF 11-24mm f/4L, Canon EF 16-35mm f/4L IS, Canon EF 17-40mm f/4L, EOS 1D X best lenses and EOS 5DS R best lenses reviews.